Twin pregnancies have been on the rise in the last few decades, resulting in about 3 out of 100 pregnant women carrying twins. This heightened likelihood of having twins is mostly due to the advances in infertility treatments and the fact that nowadays, women tend to enter motherhood at an older age. 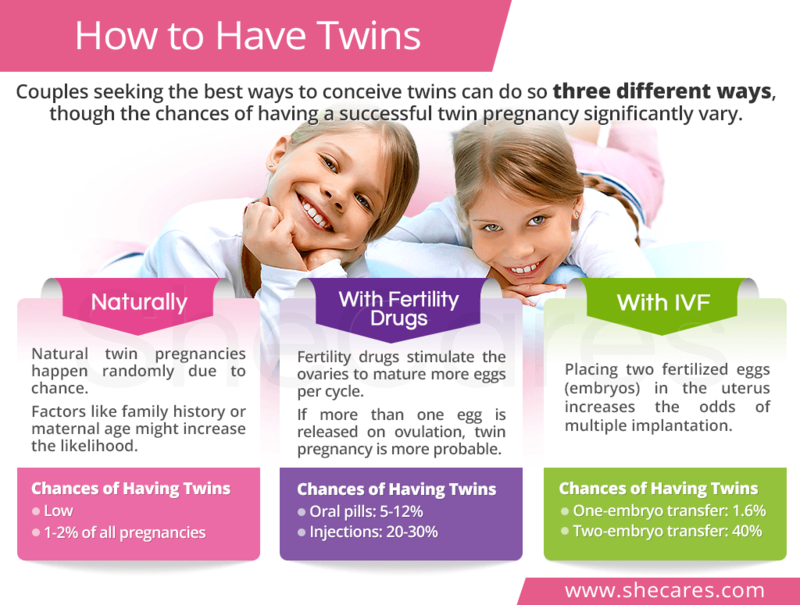 Understanding how one can increase the chances of having twins through various methods is a useful step in pre-pregnancy planning. Continue reading to learn everything you need to know about conceiving twins, including the chances of having twins naturally, with fertility medications, and reproductive assistance as well as the risks of carrying multiple fetuses. Before discussing various ways to get pregnant with twins, it is worth spending a moment to gain a good understanding of the two ways in which twin pregnancies, identical and non-identical, actually occur. An identical twin pregnancy, also known as monozygotic or non-fraternal, occurs when one egg becomes fertilized by one sperm and undergoes a division into two separate embryos. Identical twins are less common, accounting for around one third of all twin pregnancies. A non-identical twin pregnancy, also called dizygotic or fraternal, happens when two eggs are released on ovulation, and both are fertilized by two separate sperm. Non-identical twins are more common, accounting for around two thirds of all twin pregnancies. There is no scientifically proven method of ensuring a natural twin pregnancy because multiple pregnancies happen randomly due to chance. Family history of twins. The maternal history, not paternal, doubles the chances if mom, you, or grandmother was a twin. Ethnicity. Women of African and European descent have the highest rates. Previous twin pregnancy. 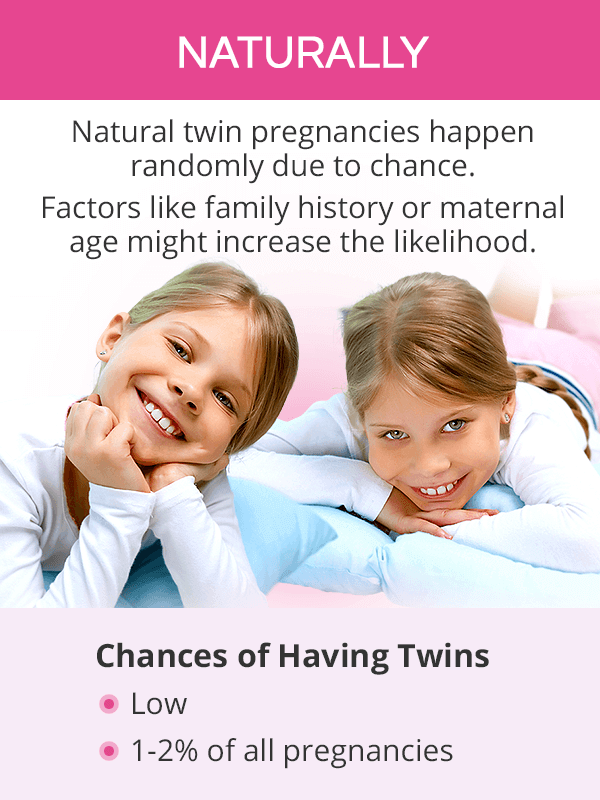 Chances are 4 times higher if you already conceived fraternal twins. Height and weight. Women who are tall and have a BMI of 30 and above are more likely to have twins. Maternal age. Women are 3 times more likely to conceive twins naturally if they are between the ages of 35 and 40 than those between the ages of 20 and 25. The likelihood of having twins naturally is low, about 1-2% of all pregnancies, which means that about one to two in every 100 will get pregnant with twins, about 0.45% of which will have identical twins. The chances of having twins after 30 are higher than in younger women due to increased levels of follicle-stimulating hormone (FSH) elevating the odds of releasing two eggs on ovulation. Fertility pills and injections, such as clomiphene pills and gonadotropin injections, are used to stimulate the ovaries to mature a higher number of eggs. With more eggs maturing in the ovaries, there is a heightened chance of two of them being released on ovulation, which - in turn - makes it more probable that both of them will be fertilized. The likelihood of having twins while on fertility drugs is higher than in the case of natural conception without them. 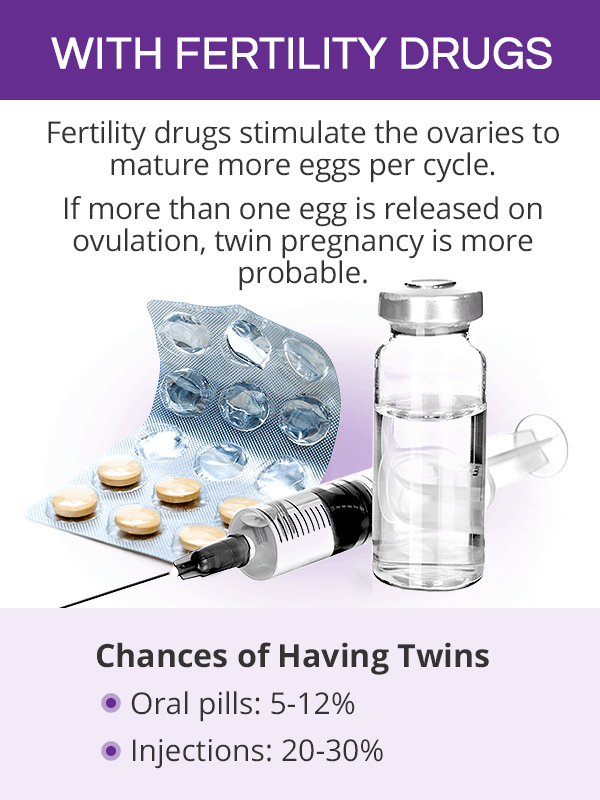 With oral fertility medications, there is a 5-12% chance of getting pregnant with twins; whereas, fertility injections increase the chances to 20-30%. In vitro fertilization (IVF) is a type of assisted reproductive technology (ART). It consists of retrieving a woman's eggs from the ovaries, fertilizing them outside her body, and transferring them to the uterus so that they implant. Up until recently, it was common practice to place several fertilized eggs (now referred to as embryos) in the uterus to increase the odds of successful implantation. This significantly raised the chances of conceiving twins if more than one embryo implanted. Nowadays, more advanced technology enables the screening of the embryo quality prior to the transfer, which often results in only one embryo being placed in the uterus, given a woman is healthy and younger than 35. The likelihood of having twins with IVF is high, depending on the number of embryos transferred to the uterus. If one is transferred, there is a 1.6% chance of twins. 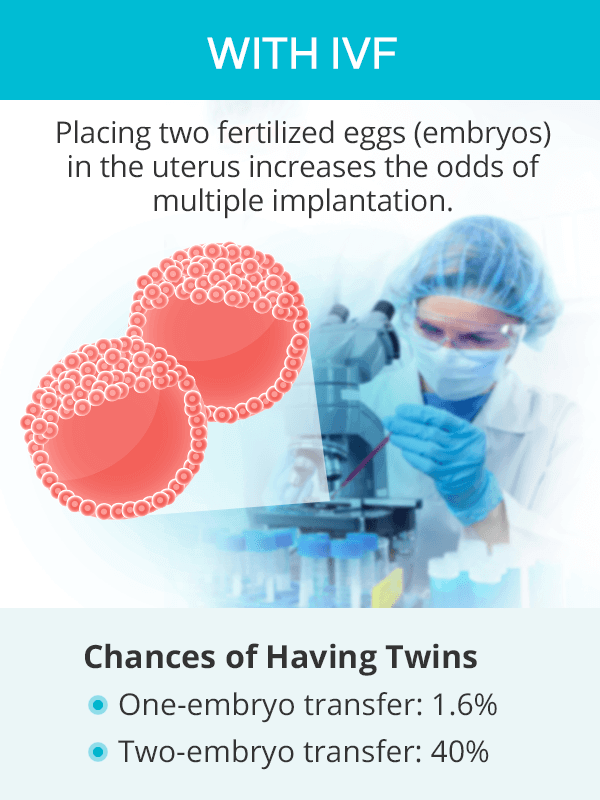 If two embryos are transferred, the chances of conceiving twins increase to 40%. Premature birth, which is defined as birth before 37 weeks of gestation, happens in about 60% of twin pregnancies. Preeclampsia, which occurs when a woman develops high blood pressure with kidney or liver problems, affects up to 15% of pregnancies with twins. Gestational diabetes, which is a type of diabetes that only happens during pregnancy. Miscarriage, which is pregnancy loss that occurs in the first 20 weeks of pregnancy. In about 20% of twin pregnancies, one of the babies is miscarried, a complication called a vanishing twin. Stillbirth, which is when the baby dies in utero after the 20th week of gestation, accounts for 1-2% of twin pregnancies, in comparison to 0.5% of those with a single baby. Postpartum depression has been found to be 43% more likely in mothers to twins than those of singletons. Other common complications affecting the health of the baby might include certain birth defects, low birth weight, or twin-twin transfusion syndrome. Because twin pregnancies happen randomly, those conceived naturally are quite rare, accounting for no more than 2% of all pregnancies. Various factors, such as family history of twins, maternal age, or ethnicity, play a role in making women more likely to have a multiple gestation pregnancy. Other ways to increase chances of having twins is through fertility medications to stimulate the ovaries to mature more eggs. These medications elevate the odds of twin pregnancies up to 12% if taken orally and up to 30% if taken as injections. At last, conceiving twins through IVF is possible in 40% of two-embryo transfers. Besides educating women on particular chances of having twins, it is also important to inform them about the higher risks of complications arising from carrying multiple babies, which most commonly include premature births.